Explore the plethora of planets outside our solar system with new multimedia experiences from NASA's Exoplanet Exploration Program (ExEP). In addition to a new Exoplanet Travel Bureau poster celebrating a molten world called 55 Cancri e, space fans can enjoy a 360-degree visualization of the surface of the same planet, a multimedia journey into the life and death of planetary systems, and a major update to the popular Eyes on Exoplanets app. Designed in the style of vintage travel posters, ExEP's popular Exoplanet Travel Bureau poster series imagines what it might be like to visit known planets outside our solar system, or exoplanets. 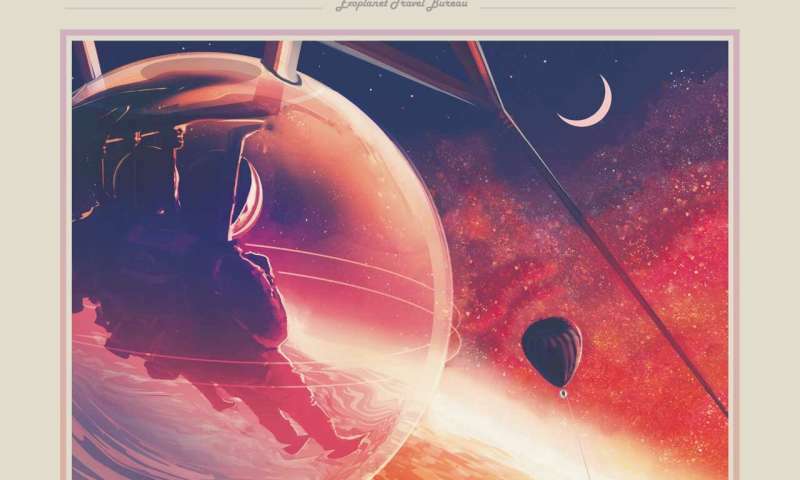 Focusing on 55 Cancri e, a planet that may be covered in a lava ocean, the newest poster shows futuristic explorers gliding over the red-hot landscape in a protective bubble. 55 Cancri e is also now part of the Exoplanet Travel Bureau's 360-degree visualization tool, which enables you to take a virtual tour of what the planet's surface might look like, based on the limited data available (no photos of the planet exist). Seen as a massive fiery orb on the horizon, the planet's star is 65 times closer to 55 Cancri e than the Sun is to Earth. On the planet's cooler nightside, silicate vapor in the atmosphere may condense into sparkling clouds that reflect the lava below. All of the 360-degree visualizations are viewable on desktop computers, mobile devices and through virtual reality headsets that work with smartphones. How did we get here? How do stars and planets come into being, and what fate awaits planets after their stars die? The interactive web feature "Life and Death of a Planetary System" brings readers on an in-depth journey through the formation, evolution and eventual demise of a solar system. This multichapter story offers insight into how the planet we call home formed and what will happen to it when the Sun dies. Explore thousands of new worlds, both strange and strangely familiar, with NASA's Eyes on Exoplanets 2.0. Users can fly through the galaxy and virtually visit any of the nearly 4,000 known exoplanets, all visualized in 3-D. Interstellar ports of call include the TRAPPIST-1 system of seven Earth-sized planets, the potentially molten-lava-covered 55 Cancri e, the egg-shaped WASP-12b and Kepler-16b, the first world discovered orbiting two stars. Among other features, the searchable Eyes on Exoplanets 2.0 lets users compare an exoplanet's size to that of Earth or Jupiter; determine how long it would take to travel to a given planet by car, jet or light-speed starship; and interact with virtual models of NASA space telescopes, such as Hubble, Spitzer, Kepler and the newly launched Transiting Exoplanet Survey Satellite (TESS). Eyes on Exoplanets 2.0 is powered by data from NASA's Exoplanet Archive, the official database used by scientists researching exoplanets. Available for use on desktop computers as well as most smartphones and tablets, this next-generation, browser-based version of the popular app requires no software download. The Exoplanet Travel Bureau was developed by NASA's Exoplanet Exploration Program communications team and program chief scientists. Based at the agency's Jet Propulsion Laboratory in Pasadena, California, which is a division of Caltech, the program leads NASA's search for habitable planets and life beyond our solar system. The program develops technology and mission concepts, maintains exoplanet data archives and conducts ground-based exoplanet science for NASA missions.